Description: Automatic time-tracking software, that tracks websites and applications usage, users' productivity, projects and help understand how the time is spend. 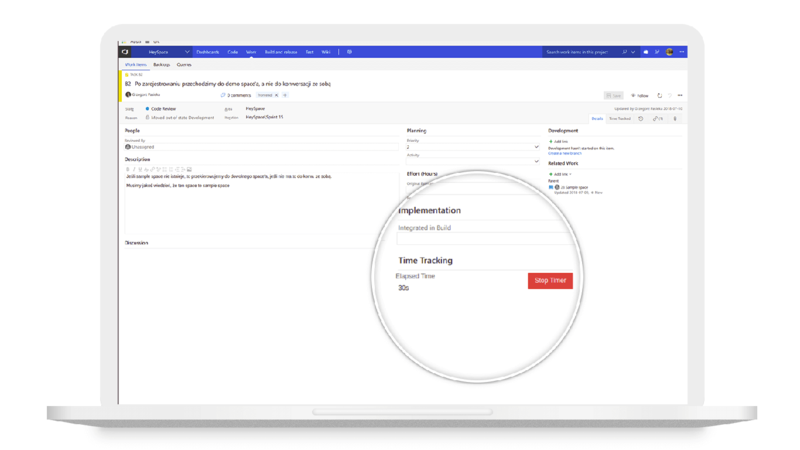 Bring seamless time tracking into your Visual Studio Team Services! With TimeCamp and VSTS integration you can not only keep an eye on team’s working hours but also managetime budget and productivity of all the WorkItems. Get the TimeCamp button and track timefor each work item or add the duration manually - your data will appear in TimeCamp instantly. Once you integrate timecamp.com with VSTS, you’ll get the detailed reports on how you’re performing. TimeCamp is an advanced time-tracking app which also offers a variety of reporting, billing, and invoicing features. It is the perfect management tool for many small, medium, and large businesses around the world which struggle with cumbersome time tracking programs, inaccurate client bills, and lost and inaccurate reports. Available almost anywhere in the world, TimeCamp tackles and solves many significant business problems, and has a flexible payment scheme with a free plan to make it even more attractive. Generally, TimeCamp offers three types of services: Timesheets, Desktop time tracking, and mobile time tracking. As we already mentioned, all services are reinforced with billing, invoicing, and budgeting features, while users are also counting on a plethora of smooth integrations to make the program work for other purposes too. On top of that, TimeCamp is designed to be simple and easy to use, and can be embraced even in teams with no time tracking software experience. TimeCamp will list workspaces and projects you’re assigned to. Select these youwant to synchronize. TimeCamp will automatically import your projects - once you track time for them inVSTS, the result will instantly appear in TimeCamp!